By Alexandra Cheney. 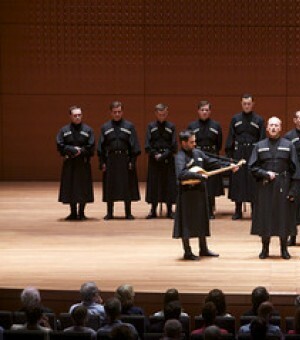 August 15, 2010, "The Wall Street Journal"
Polyphony is concept that’s defined as the interweaving of two or more melodic lines within a larger composition. It’s also the inspiration for Pierre-Laurent Aimard’s six-part “Bach and Polyphonies” series, which premiered Friday night at Lincoln Center as a part of the Mostly Mozart Festival. In the opening polyphony show, Aimard braided together a program from the artistic contributions of the 18-member Ars Nova Copenhagen and the Ensemble Basiani, an all-male Georgian group that chants sacred and folk songs. Alternating the play between the two groups, Aimard engineered a sense of adventure throughout the evening.